The Parker Jotter has been around since the 1950s, and it is probably the nearest thing to being the classic click-style pen. It has a durable stainless steel and hard-plastic construction, a light and compact build, and a retracting mechanism that makes one of the most satisfying “clicks” I’ve ever felt. 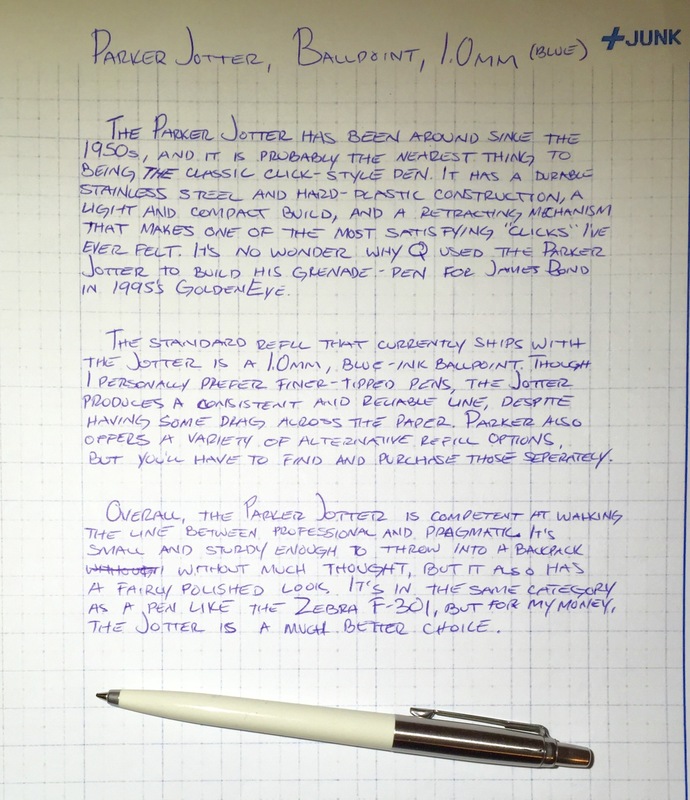 It’s no wonder why Q used the Parker Jotter to build his grenade-pen for James Bond in 1995’s GoldenEye. The standard refill that currently ships with the Jotter is a 1.0mm, blue-ink ballpoint. Though I personally prefer finer-tipped pens, the Jotter produces a consistent and reliable line, despite having some drag across the paper. Parker also offers a variety of alternative refill options, but you’ll have to find and purchase those separately. Overall, the Parker Jotter is competent at walking the line between the professional and the pragmatic. It’s small and sturdy enough to throw in a backpack without much thought, but it also has a fairly polished look. It’s in the same category as a pen like the Zebra F-301, but for my money, the Jotter is a much better choice. The Parker Jotter also made an appearance in Mad Men. That One Pen has a nice discussion on the Parker Jotters and all the minor changes in the design over the years. Review at Pen Addict. He liked refill in this version, which is technically the 60th Anniversary Edition, much better than previous versions.